“Christmas Is…” is a new holiday collaboration of three self-styled New York City-based artists: Candice Corbin, Teresa Fischer, and Andrew David Sotomayor. Throughout the album, each of them contribute their own unique musical and creative talents for a collection that honors traditional Christmas memories, yet frequently adds a generous dose of fresh and fun originality. The singers often take turns with lead vocals, but also provide background vocals for each other: a supreme example of three diverse voices coming together as one for a truly unique sound. Like a Kris Kringle party, there are lots of surprises on this 12 track CD. “Christmas Is…” opens with “This Endris Night”, a 15th Century carol which immediately establishes the trained vocal skills of the all three singers. Champagne-voiced and soulful Candice Corbin takes the lead with the second track, the underappreciated classic “That Spirit of Christmas”. She hits some impressively complex notes with her effervescent yet smooth voice, minimally adorned with Andrew David Sotomayor’s piano. Beyond Corbin’s amazing delivery, the song’s lyrics are a reminder about the true meaning of Christmas, which is sometimes lost in the sadly rampant commercialism and materialism of the modern holiday season. Corbin does similar justice to “I’ll Be Home For Christmas” later on in the album, delivering some truly intoxicating moments for this timeless favorite (Give it a listen and you’ll know JUST what I mean!). As for her version of “O Holy Night”, let’s just say that Candice shows just how it SHOULD be done. If you are gonna attempt this song, your voice better reach for the sky! The listener will be left speechless. Teresa Fischer is a praised cabaret singer known for her sassy, often hilarious delivery as well as her ability to unearth some lost musical gems just dying to be heard again. For her blending of two Yuletide favorites (“Still, Still, Still/Silent Night”), the Titian-haired diva proves that underneath her affinity for the humorous side of music, she’s still an accomplished vocalist. Later on, she gives us another unsung hero of a holiday classic, “The Christmas Wish”, delivered with a childlike, wide-eyed awe and showing respect for decades of Christmas-inspired lyrics throughout the decades before her. But fans of Fischer’s sassy style won’t be disappointed: One of the original tracks is ” Please Don’t Make Me Sing a Christmas Ballad”, co-written by Fischer and Sotomayor about Teresa’s own experience as a cabaret artist. It’s quintessential Teresa (The title should be enough of a teaser…), a mirthful showcase for her idiosyncratic style. 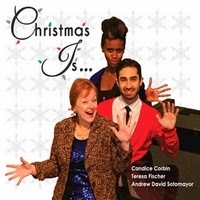 Andrew David Sotomayor is Musical Director of “Christmas Is…”, and he also provides the album’s piano work. He also wrote or co-wrote four of the tracks, all of which deserve to become new holiday classics for a new generation. The first of these original gems, the pop-flavored “Christmas Boo”, is youthful, fresh, and fun, with an infectiously catchy rhythm. You didn’t have to be at the CD release party to visualize Candice and Teresa in the background, adding some glamor girl-style background vocals for some deliciously decadent adornment. The second Sotomayor original, “My Epiphany”, is an original, smart, and hilarious (and, dare I say, “educational”!) musical gem about the often overlooked Christian feast day which traditionally falls on January 6th. Like a stocking that hangs from the chimney, “Christmas Is…” is stuffed with all kinds of treats. Corbin’s interpretation of George Michael’s emblematic “Last Christmas” is flawless. If Michael’s original was provocative, this version is quietly heartbreaking– and the percussion, courtesy of Hiroyuki Matsuura, is a particularly nice touch. Fischer gives us a nicely naughty treat with the deliciously demented “Pretty Little Dolly”, a song originally performed by voice-over artist Mona Abboud on “The Tonight Show” in 1966 (!). And, everyone who listens to the CD will be inspired by a standout lyric from the album’s original title track, courtesy of Mr. Sotomayor: “No matter the way you choose to believe, The love of the season is yours to receive…” This is a holiday soiree you don’t want to miss! “Christmas Is…” is available from I-Tunes and CD Baby. Previous THIS COULD GET HAIRY! Meet BearScots, the Bears of Scotland!